ABU DHABI: Spinner Shadab Khan gave spectacular performances with the bat and ball on Monday, helping Pakistan to a 32-run victory in the second day-night international against Sri Lanka in Abu Dhabi. The young cricketer first came to the rescue of a shaky Pakistani batting side, scoring an unbeatable 52 off 68 deliveries and playing a support role in an invaluable 109-run seventh-wicket stand with centurion Babar Azam, after Pakistan were left struggling at 101 for 6 on a sluggish Sheikh Zayed Stadium pitch. Pakistan, who had won the toss and chose to bat first, found the going tough as they lost half the side at the end of 20 overs for just 79, but Azam and Shadab led the fightback as Pakistan posted a 220-run target for the Sri Lanka. 23-year-old Azam knocked a fighting 133-ball 101 to score his second successive century in the series. Later, Shadab spun his magic with the ball, picking up 3 wickets for 47 runs as Pakistan dismantled the Lankan side for 187. Pakistan now lead the series 2-0. The remaining matches will be played in Abu Dhabi (October 18) and Sharjah (October 20 and 23). 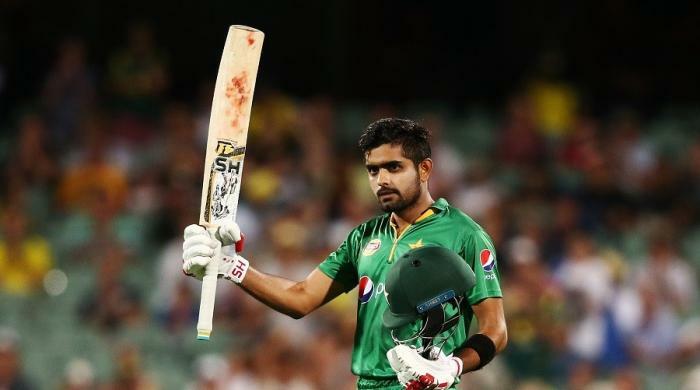 BABAR AZAM ETNERS RECORD BOOKS: Pakistan’s flamboyant batsman, and probably the most dependent batsman of the current lot, Babar Azam has scored yet another century in ODIs, his seventh of career, came during the 33rd inning of his career on Monday. Babar smashed six boundaries to score 101 off 133 deliveries to achieve several records simultaneously. The 23-year old batsman has now most numbers of runs and most numbers of centuries in his first 33 ODI innings. With a crucial inning of 101, Azam has now scored 1659 runs in the first 33 innings of his ODI career, nine more than South African great Hashim Amla. He is also now the quickest to reach seventh ODI ton by reaching it in 33 innings, next to him is Hashim Amla with seven tons in 41 ODI innings. Zaheer Abbas reached seven ODI centuries in 42 innings while Quinton de Kock reached his seventh ODI century in his 50th innings. His current batting average 57.20 is second best among all the batsmen who have batted at least 30 innings in one-day-internationals. Only above him is Ryan ten Doeschate whose batting average is 67.00, mainly because of greater numbers of not-outs in his career. The century on Monday was Babar’s fifth consecutive in UAE, which makes him the first ever batsman to score five consecutive tons in one country. He scored a hundred in his first ODI of the on-going five-match series against Sri Lanka. He also scored three back to back centuries against West Indies earlier in UAE. He surpassed South Africa’s AB de Villiers who scored four consecutive centuries in India between 2010 and 2011.